Natalie, the Striped Pedlar helps a youngster make a bicycle smoothie! 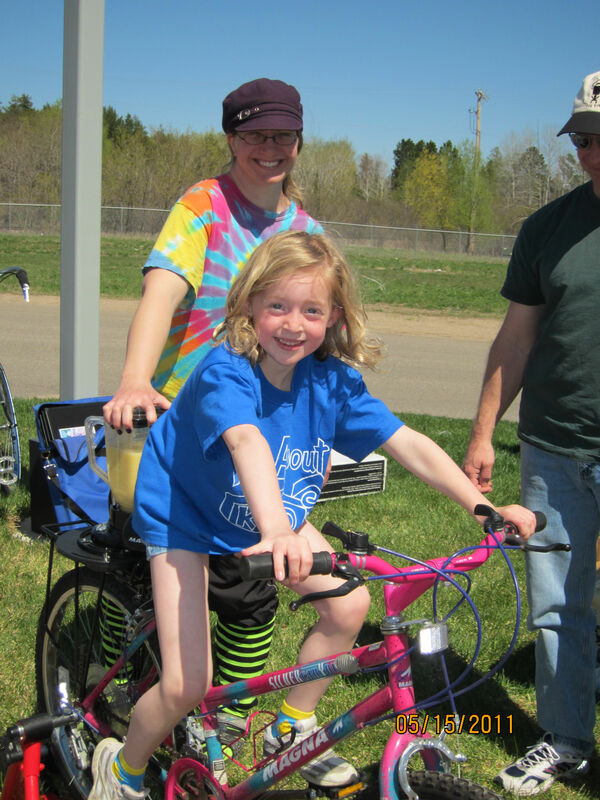 What a weekend for cycling in Bemidji! 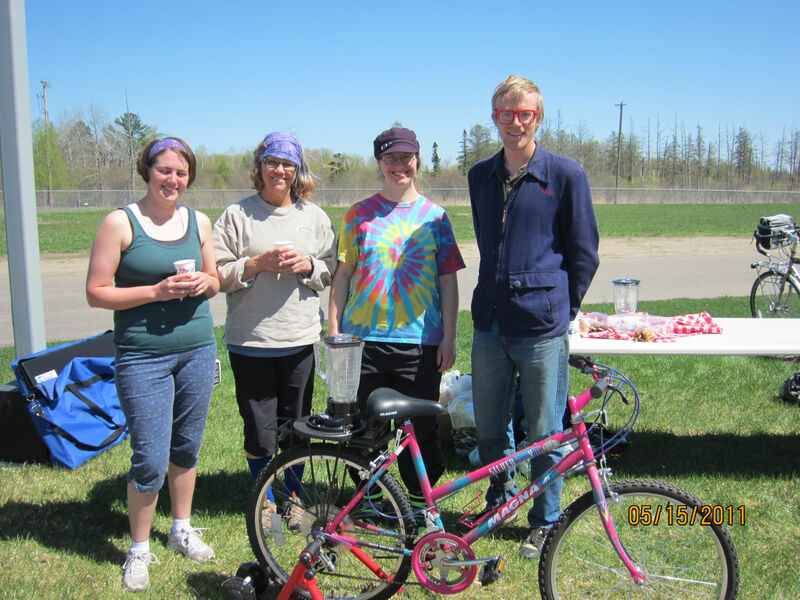 Friday and Saturday the Rail River Folk School hosted Bemidji’s second Traffic 101 Smart Cycling course. Nick Mason from The Bicycle Alliance of MN and I taught the fast paced 9 hour course developed by The League of American Bicyclists. We covered bike comfort, basic mechanical adjustment and repair, safety, and principles of traffic law. We drilled emergency stops and turns and practiced riding in traffic. Maybe you saw us in small groups cruising the streets of Bemidji. Eleva Potter, Lisa Boulay, Cody Bartz, Chris Kriener, Diana Kuklinski, Rocky Wimme, and Natalie Gille graduated on Saturday afternoon better cyclists than they were Friday. Watch for more Smart Cycling opportunities in the Bemidji area. Today was the Bike It! event at the Parks and Recreation Facility on 5th street. An obstacle course with real traffic signals, the bicycle blender, helmets, bike check ups from The Bike Guy, and a Rover 8 trike for test rides, all with perfect weather. Many thanks to the Traffic 101 graduates who showed up to help and Samantha Parker for putting on a quality free event. Eleva, Lisa, Natalie, and Cody, new Traffic 101 graduates helping out at the Bike It event today. Love this sight ! Makes want to ride my bike even more !